A few months ago, friends asked me to choose a Memory Tree for my mom. I knew immediately which tree it would be. Witchhazel! There were a few chuckles from family members. But, my choice of a Witch-hazel wasn't an attempt to be ironic. It was just the perfect tree. H vernalis, also known as Ozark Witchhazel, blooms in the late winter. That is how it was with my mother. She bloomed in the winter of her life. Later then we all wished for her...but she bloomed. At the age of 82 she sold her house, let go of her old life and moved into a retirement village. She quickly made new friends and tried new activities. Her schedule was full and so was her life. When we phoned her she was often too busy to chat. We were all thrilled for her! Mom bloomed! It's the perfect tree to commemorate her. My mother's tree is small right now, but it will grow to be a lovely understory tree. especially with the marker from my friend Tina (In The Garden). "Why Bernice, xxoo? ", you might be wondering? My sisters and I always referred to her as Bernice. As in, "Have you heard what Bernice did today!" The hugs and kisses were a part of every card or letter she sent me from the time I left home to go to college until she passed away. She never forgot how much they meant to me. This fall the leaves of her Witchhazel will turn a lovely golden yellow. Later, it will flower and scent the garden with a sweet fragrance. I was surprised to find buds along all the stems, so I know it will flower this year. Next winter there will be even more blooms and fragrance. Visitors will notice it as they walk to the porch. H vernalis blooms when little else is blooming. It has small spidery flowers on the bare gray branches that could begin blooming as early as December or later. The flowers are yellow or reddish. It has been said, that each tree's flowers are a bit different; so we will see what this little tree brings us. What ever color it is, the blooms will last for 3 to 4 weeks. If the temperatures dip and we have a frost, the petals will fold up for protection. What a wonderful survival behavior. Can you imagine fragrance and flowers in the garden in the middle of winter? So nice! Now imagine a sweet little tree, blooming it's head off in a snow covered landscape! Even nicer! So Zone 4 and 5 gardeners, take note, you can grow Witchhazel. The horticultural name hamamelis, means "together with fruit". The fruit, flowers, and next year's leaf buds all appear on the branch simultaneously, a rarity among trees. (Wikipedia) The hard woody, 1/2" long fruit capsules splits down a 2-parted tip in September or October. The seeds are forced or 'shot-out' to a distance of 30'! People have heard the pop, but I haven't! My hope is that they sprout in my wildflower garden! I do like this tree. H virginiana live at Clay and Limestone. While it is reported that they all prefer moist, slightly acid soil, they will tolerate clay! It is not unusual to find the Witchhazels near stream beds. I do keep them watered during our driest months. I lost two 20 foot trees in the drought of 2007 and don't want that to happen again. with sweet yellow flowers. If you look closely at the above photo, you can see that the buds look like they are getting ready to open! We will have flowers and fragrance very soon. I am not completely sure when H vernalis will bloom, since this is its first winter in the garden. It could be in December or as late as February. Hamamelis x intermedia 'Diane' - will bloom on a similar schedule. She is the showiest of my Witch-hazels. Her flowers are coppery-red to bronzed-red (this photo is from the Missouri Botanical Garden) and mildly fragrant. There is one problem with this particular Witchhazel... the dead foliage persists on the branches in winter. I will have to remove the browned leaves in order to see the pretty bloom! I prune Diane to keep her fantastic vase shape. 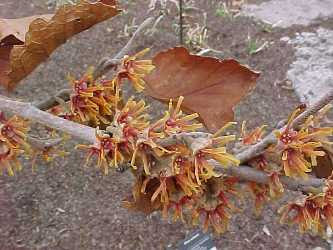 To keep Witchhazel's growth in check in smaller gardens or to keep it from suckering you may have to prune. There is nothing wrong with letting the Hazels sucker. H virginiana (below) has begun to sucker...but I haven't decided if I want to prune out the suckering stems yet. They can grow to make make a nice hedge or screen if you have the space. It may be pushing it to say that witch hazel is a tree with total year round interest. There are some bare times! But, here is what you get: a unique small tree/shrub with fragrant, attractive flowers from late winter into early spring, when little else is blooming in the landscape. The pleasant green leaves of summer are a nice change of pace from the lance shaped or little leaves that often proliferate in the garden. that light up the shade. Not bad. If you garden in a rural area, you may even have turkeys or grouse visit the trees for the seeds and flowers. All in all, a very nice tree and the perfect Memory Tree for my mom. Thank you Joanne, Joan and Mary Helen. Thank you, Tina for the marker. Hugs and Kisses for you, Mom. What a lovely way to remember your mom, and, after your explanation, it does seem like an appropriate choice. Hi Gail, the little tree is a treasure as is Tina's sign. I cannot think of a better way to remember a lost loved one that with a tree and this choice is perfect. We do grow Diane here, she flowers for us in February and each flower is a slightly different color. The suckers produced are the yellow kind, vernal? because most of the fancy varieties are grafted, the root stock being hardier. At least mine is. I have tried to root the suckers for new trees, but we had the late freeze and drought ending that. They do need more water than the other trees, but we are both willing to provide that. May your tree live long and prosper! What a nice memory tree. I'm sure it will bring a smile to your face and many memories when it blooms early in the year. Gail ~ What a wonderful tree to choose to remember your Mom. I've always liked Witch Hazels myself, as not much can bloom here in February! What a wonderful way to remember your Mother. I love the Memory Tree & the marker. Very nice. I have one witch hazel - 'Diane' - but it has never bloomed. Do you have any idea why? What a great choice for a tree to honor your Mom! I also think that Diane looks great pruned into a vase. Glad the stone fits in too. Wonderful choice for a memory tree. I haven't seen any in Illinois but I had one in my yard when I lived in Alabama. I read that the name comes from the old English wiche meaning flexible or bending. Flexible kind of describes your Mom. Bending but not breaking. Wonderful tree and story. Never thought of Withc Hazel as a plant/tree. Probably not a good one for zones 8 9. Thank you...she was something else! I think the tree is perfect for her, she would laugh at the choice. What a great tribute to your mom Gail. Thanks for all the info on Witch Hazel. I think it is a very unique tree but I haven't tried growing it. I think Diane is gorgeous and I wish she weren't so shy and drop those brown leaves! I will be out there picking them off before she blooms! The root stock is probably virginiana...much easier/cheaper to get their hands on then vernal... If you can get the suckering bits to grow you will have better fragrance then Diane! The leaf shape is really nice in my sea of green! Thanks! I think my mom would chuckle at the choice! I look forward to its blooms...it's planted near the porch so I can sit there and breath in the fragrance. Do you have them in your woods? I bet they are a wonderful surprise to come upon when walking in the winter! I can picture that now! This is a wonderful way to keep the memory of your mother alive, Gail. After reading all the attributes of the witch hazel, it seems like the perfect choice! I think we would all enjoy something that blooms in winter. Aren't we lucky to have such sweet markers from Tina! It is lovely to see it there by my Mom's tree! It's a good tree and will add a lot to the garden. It took a while for Diane to get settled and happy in my garden....maybe 4 years? Make sure that her feet are cool and she gets some sun on her leaves. But not hot afternoon sun if you live in the south. You might want to test the soil to be sure it is not too alkaline...they like it a bit acidic. I hope it helps! I was hoping you would see it! I have wanted tio mention it several times but was holding off for this post! Doesn't it look fantastic! I know you are too polite to agree and sound bragging BUT you did a great job and so appreciate it! My mom would love and you! I think we both like looking info up! It's fun isn't it! I read that, too and thought I could have a ton of fun writing about the magical aspects of the tree! I think my Mom would approve of the tree, she did have a great sense of humor. I do like this tree! It was a perfect choice for Mom! My sisters really did chuckle over the choice! I can highly recommend the tree...it is not going to over power most gardens and it has great fragrance and flowers when we really need them! Monrovia says Diane will grow in Zone 9! I say go for it! It is a lovely tree/shrub depending on how you prune it! Let me know if you decide to get one! A unique tree and a great accent to the garden! When my pals told me to pick out a tree...I think they were thinking Gingko or Fringe Tree so the Witchhazel was a surprise to them! People don't think of the Hazels very often. What a lovely plant to commerate your Mothers life. The Bernice OX brick is a nice marker too. I enjoyed reading your story. I wish you peace with this planting. That does sound like the perfect tree to remember your mother by. After reading your description of it, I was wishing it would grow here in my Zone 8b garden. Gail, this is beautiful. I can picture your mother smiling at you. Your entries always make me miss my country home with acres of flowers, woods and animals. That is so classy. What a whimsy looking shrub/tree. It is happy no matter what the occasion just like your mom. Gail, what a lovely tribute. Based on your words, I'd have to say you DID pick exactly the right tree. I hope it prospers in your garden and brings you years of happiness as your Mom did. Aren't gardens (and accessories, plants,....) a great way to commemorate loved ones? I made a garden for both my father and a year later my father-in-law. what a wonderful way of reminding yourself about your mother and the love she showed you. it would be so cool to see the snow covered witchhazel blooms. i am quite sure she would approve. What a lovely and well-thought out tribute to your Mother - I'm sure it all would have made her smile. And it's wonderful that she bloomed so beautifully late in life - that's a special blessing, too. Generous friends, a distinctive marker and a cool tree - can't imagine your gregarious late-blooming mom could do anything but think you're a genius for putting this memorial together, Gail! Back in the far Western burbs of Chicago I saw Witch hazels grow in places like parks and at the Morton Arboretum but not in gardens. That was nearly a decade ago - bet people are more adventurous now. That is so very wonderful Donna! I love that story, thank you for sharing it! We loved calling her Bernice....but she was always Mom to her face. I grew to appreciate her! 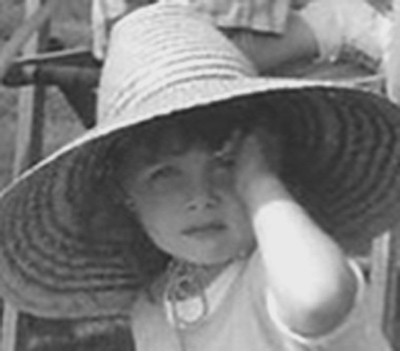 She was a funny and bright woman..had she been born later she would have been a college grad and had a great career. I think it can grow in zone 9, so you might be able to have one. I know I really like having them in the garden. I have four of them! You must get one! They are perfect little trees! They won't grow to fast and take over and even if they grow to their full height...it's only 20 feet tops; and that's in the wild. Do get one or two! Oh, my spray painted her peony! I bet she never forgot he did that. Trees are a good way to honor a loved one. Peonies have a long life so they are great, too! I just live a few miles from you! But it does look like the woods in the photos! That was deliberate on my part. My mom would smile...she had a good sense of humor. Classy huh! You as always WAY too kind! It is a great tree..I wish I had seedlings I could send them to everyone! You, too. Thank you! I think it is a pretty good little tree and a perfect one for my mom. It is already making itself at home..once it blooms I will post a photo! I remember that gardens you made.... they seemed so full of love. I am glad you reminded me of them! I would love to see the snow here sometime! I remember when it occasionally snowed....it stayed just long enough. 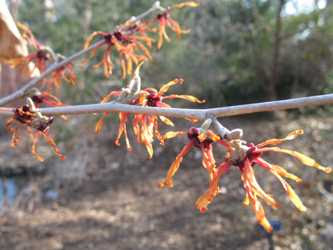 The witchhazel would look great blooming in the snow. I feel very lucky to have such supportive friends Annie! They didn't choose a tree but let me be me with the whole process! They are the best people. I imagine the trees looked spectacular at the arboretum. There is nothing like a park setting with gardeners to make us appreciate a good looking tree. Native trees like H vernalis are available at native plant nurseries but not available at most nurseries. Isn't that too bad. A great tree to memorialize your Mom Gail. I have liked the witch hazel for quite a few yrs. now. I think I would like to have one. I know the exact spot for it. I'm in zone 9 so I think it might work. I sure hope so. I like the one that has the orange y/red coloring. Would that be the Diana? A beautiful tribute to your mum, Gail. I loved reading about how you called her Bernice and the significance of the x's and o's on the marker. The Witch Hazel photographs are beautiful. I love the blooms. The Helen Keller quote is so true! A living tribute to your Mother-wonderful! And to know just which tree represents her life is so great. Now it will be like she is right there with you as you enjoy your garden. What a great post about a memorializing tree ... I hadn't heard of doing this before, but it's such a great idea. I wish we had room for another tree here, but alas, we're constrained by space here in the city. When I was a kid I never understood what Witch Hazel was (though we had the lotion for poison ivy and bug bites), and just thought it was something a Witch named Hazel had dreamed up. I knew that Fletcher's Castoria had something to do with something called castor, and now we grow them in the yard, lol. They are beautiful trees, and you're so lucky to have the space for them! That is so lovely Gail. Just doing some blog surfing - very nice post. We planted a tree in memory of my oldest daughter's best friend in college that passed away in a single car auto accident. I didn't know what to call it - just called it the "Alison Tree." That was probably four years ago. If you look on my blog you'll see that our daughter just got married last Saturday. Alison's parents flew all the way from Michigan to Oregon to attend our daughters wedding - seeing what they would never get a chance to see their daughter do. It was a very touching moment getting to meet them. I had not realized that my daughter never told them about the tree. They were pleased when I told them about it - they didn't see it, but that's ok, because it's kind of scraggly - their imagination was probably better looking than the real thing. Diane is a really pretty tree! I am glad you want one in your garden...I wish you could show us a photo of her in her new home. 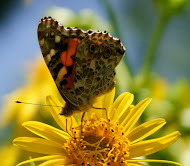 Thank you for stopping by...I am glad you enjoyed the flowers..they are really quite interesting to see up close. I will have to post them once they are in bloom. I do like the Helen Keller quote, it is so true. So true! I see the tree now and smile. She would love the marker. I think that she might laugh at the Witch Hazel as her tree...probably remembering our tenser times when I was a teen! Moms! They (we) are all unforgettable. I am appreciating the space right now...in a few weeks with 50+ trees dropping their leaves I will be whining and complaining! Tomorrow is Bloom Day...will you be posting for it? I am going to show off Empress, well just a photo! Thank you! I am so pleased you think so! Thanks for stopping by on your surfing adventure. 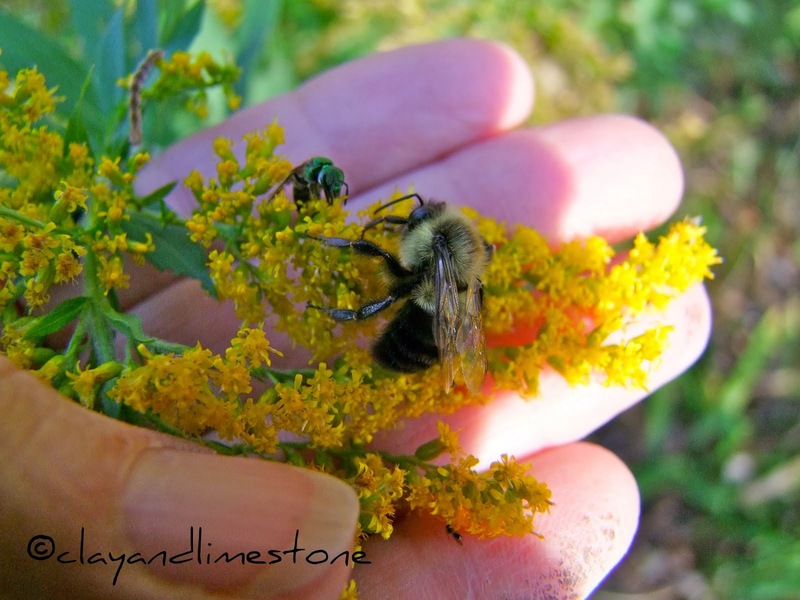 It is amazing to me how many people plant gardens, trees, shrubs and even perennials to honor their loved ones. It is a remarkable experience...very healing. I am so glad you could honor Alison with a tree and how lovely that her parents attended the wedding ans got to hear thee story of Alison's tree. I did pop over to your blog! Your sketches are fantastic! anyway come over to my blog you have been tagged. Sometimes it is hard, but I don't have children living or visiting me. Not a grandmother and that will be years from now, I am thinking! Thanks for thinking about me! What a lovely tree you've chosen as a tribute, rich with personal meaning. May you feel your mother's love each time you gaze at her tree. I think planting a tree is the perfect way to commemorate your Mothers life. At least she did "bloom" ~ some people just never do. Wonderful it happened for her no matter what stage of life. I don't know much about witch hazels but they sound incredible. Anything that will bloom in winter is welcome in my world. I'd love to hear the "pop" from the seeds as they're expelled, sounds explosive! What a lovely tribute Gail. What a lovely little tree Gail, and a beautiful tribute to your mom. The marker Tina made is lovely. What a sweet post. I have always been interested in witch hazel, and now I know something about it. Not only have you shared some interesting information, you have also shared the loving tribute to your mother. I can't think of a nicer way to have a remembrance of a loved one than to plant a special tree that has some meaning about that person's life (the late blooming) and set a plaque at its base. So wonderful. I would hope that someone might do the same for me some day. Thank you, that was so beautifully said! I hope that I do. Thank you! It was a delight to see my Mom have so much fun and let go. The pop would be something else to hear! I am trying to figure out how long it took for someone to realize the seed heads popped open! I think we all need a Witch Hazel in the yard! Isn't the marker perfect! I so appreciate it and it does make the Memory Tree look like a memory tree. It is a fabulous little tree. What a lovely comment...You know, the tree was fun to pick out and now that it is in the garden...it clearly belongs here. My mom would approve! I am more than sure that you are well thought of deeply loved by your dear husband and family! Oh, yes, the Witchhazel is the perfect tree to memorialize your mom. Vernal Witchhazel is such a beautiful one. I love all the Witchhazels & wish I had room for more. I'm still waiting for mine to come into full color, but I did find one of those capsules on it yesterday. Aren't they incredible trees. Do you have H virgiania, vernalis or a hybrid? I want to hear them pop but expect not to! MMD, I think it's a great memorial tree, too. No irony, just a great tree! Great idea for a memory tree for your mom. I'm sure your mom knows about her witch hazel tree and enjoys it even now. I really like witch hazel, it's very medicinal. My mom passed 15 years ago, and I transplanted a rose I had planted for her at her house into my yard before her house was sold when my dad went into assisted living. It's an heirloom rose, "Valentine", that I had ordered as a gift for her from the Antique Rose Emporium in TX. It has grown and bloomed continuously at both her house in Jacksonville FL and my home in Tallahassee FL. Now we have moved to southeastern TN (in a rural location not far from Chattanooga), and I miss that rose. I will plant a new one here for her memory. BTW, I've never gardened in such rocky soil! Northwestern FL has clayish soil, mixed with sand and loam, depending on exact location. But this...requires a pick axe to start off with! I am using horse manure, peat moss and kitchen garbage to break up the clay and create good top soil. Removing THOUSANDS of rocks, since our house is on the side of a hill, which is so steep I am paying a neighbor to mow it for me. Always mowed myself in FL. I guess this is Tennessee soil...? ?